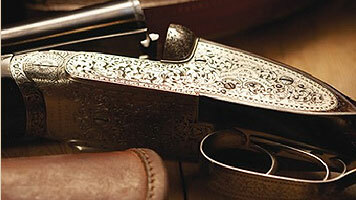 Shot guns encompass many different disciplines and many requirements; including 'game shooting', 'vermin', 'sporting clay' and 'wild fowling'. If we don't have the gun in house to suit your needs we will get it, traditional side-by-side or over and under in all gauges.
" professional unbiased advice "
We are also here to offer you proffessional unbiased advice, so if you are not sure what you need, please feel free to call or pop in and we will be happy to assist in your decision. It is almost impossible to list all the guns we have in stock and those available (usually on a next day delivery) from the manufacturer, so please call for details on the sort of gun that will fulfil your needs. turn of the century "